War Thunder Naval Battles Beta Giveaway - Grab One of 3K Codes! 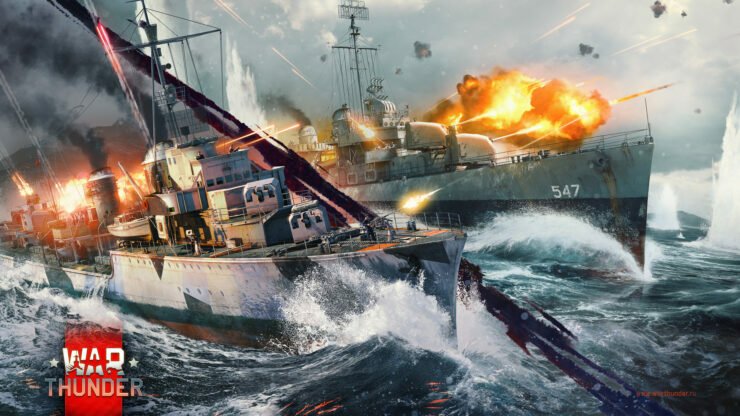 War Thunder Naval Battles Beta Giveaway – Grab One of 3K Codes! The ever-expanding War Thunder MMO game is currently beta testing Naval Battles. Thanks to Gaijin Entertainment, we’ve got three thousand beta codes (for PC) that will let you right into the naval fray. Just pick a code from the giveaway form below and activate it at this address before October 14th (which is the expiry date – all codes have to be redeemed before). Have fun on the high seas! Related KurtzPel Global Beta Giveaway – Get a Code and Try This Anime Action Game Now! Players will be able to start unlocking the ships research tree, upgrade the ships and participate in Naval Battles (combined with aviation). Fleet is now available for 3 nations – USA, Germany and USSR – with about 60 ships in total from torpedo boats to light cruisers. Special horizontal research system will allow players to quickly explore exactly the class of ships that they are most interested in. The CBT of Naval forces is available in special events “Naval battles” (Events and tournaments tab in the game). We already have naval maps from all over the world, and in latest update 1.81 we have added two more locations – “Mediterranean port” and “Green mountains gulf”. Q. Will testers earn RP and SL during CBT? Will they need to pay for repair etc in SL using the normal budget. Yes, one of the goals of CBT is to test progression and economy. Q. If we earn RP / SL, will progress be reset at the end? How many “wipes” are planned? All research progress will be wiped once only before going in to Open Beta. The exception will be crew skill points – they will be reset only if there will be changes (additions/removals) to Naval skills when Open Beta starts. Crew qualifications (Basic, Expert, Ace) for specific ships in each slot will also be wiped, and Silver Lions and Golden Eagles spent refunded. Silver Lions spent on ammo and repairs of ships during CBT will not be compensated. Silver Lions spent on ship purchase and modules will be refunded. Q. Will we be able to spend GE on modules etc for Naval and will they be refunded after the wipe? Purchasing ship camouflages and decals. GE can only be spent on purchasing crew skill points, since they are universal for Air, Ground and Navy on the crews in each slot. Skill points spent on Naval skills will not be wiped, unless there are changes (additions/removals) to Naval skills when the Open Beta starts. Q. Will players be able to stream the CBT gameplay? Q. Will CBT have the same limitations as Pre-CBT (max 2 PC per account)? Yes it will, player accounts will still only be able to access testing on a maximum of two machines. Q. Will players have to wait for the next major update for ОBT release? Naval development runs its own course and is not tied to the major update release schedule. For example, we plan to introduce the Soviet naval tree during CBT even before update 1.81. We don’t have an exact timeframe for Open Beta yet, but cbt it is planned to continue until end of 2018, but of course, this could change. Q. Are you going to increase the size of the waves in rough weather? As far as i know, the Nvidia waveworks module can do that. The tests have already included varied weather and conditions, however, most players do not like extreme weather conditions. The interest of players depends on the weather. We have different views, but currently its maximum value should not completely limit the use of any of the types of ships. Right now, players enjoy a maximum at about 4.5 on the beaufort storm scale. Q. Have you planned to have the smoke from engines and fire / explosion persist for a longer time and change according to the wind? This would increase immersion on the battlefield. Fire and smoke effects currently persist as long as there is a fire burning.